Being a Foodie, choosing my food is something very important in my day to day life. My one meal at least would be outside every day. We never know what all we consume at times. The food we consume should have calories, fiber, fat, etc. However, we might not get these in our daily food until and unless we are particular about these. We are addicted to tastier side more than a health. Recently, I got an opportunity to try food from “Jiyo Natural” – A new kid in the block. I have been ordering and trying so many dishes from multiple food tech startups in Bangalore. But, I haven’t completely convinced, when it comes to both Taste & Quality with some of the healthy foods. However, Jiyo Natural Food changed my perception and appealing to continue my orders. The Jiyo Natural is unique! Let me explain! Jiyo Natural serves food in a typical Steel Lunch Box, which gives a home food feel. Also, they have two options like Jiyo Health & Jiyo Manage. Jiyo Health – The lunch combo was served in a perfect food grade package. The combo had Millets Pulao, Carrot and Beetroot Sabzi, Yellow Dal, Sprouts & Cucumber Salad, Sautéed Palak and White beans and Multi Grain Phulka. The dishes are not spicy. However, the taste will not disappoint you! Even my parents loved the fare, that’s something commendable. I was totally overwhelmed with these options. The Millet Pulao was a show-stopper and appealing. Jiyo Natural did any excellent job with respect to health. This is a recommended combo to every individual. The meal was cooked systematically without any deep frying, with just the basic needed masalas and spices and kept salt levels to smallest. Jiyo Manage – The Lunch was designed according to weight, height and cholesterol level in individuals. Well, a dietician will review the body conditions and decide your meal, that’s something, which is highly needed in city life. 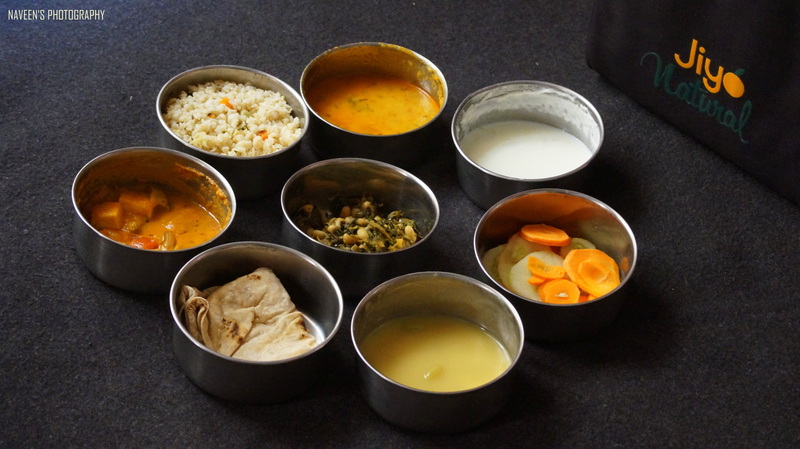 As I mentioned above, the Jiyo Manage lunch served in a stainless steel lunch boxes. The lunch boxes consist of Custard, Phulka, Palak & white beans sabzi, Paneer Sabzi, Parboiled Rice, Curd, Cucumber, Carrot and Dal. I had a thought that these dishes will taste bland. But surprisingly tastes very good though the spice level was less. This is preferable for the people who are suffering from Diabetes, high levels of Cholesterol, Thyroid, Uric Acid etc. Scientific way of cooking the food without deep frying and less usage of salt and oil. Brown or red rice is used instead of polished white rice. The menu is changed on a daily basis and covers refrains covering North Indian, South Indian, Continental and Chinese. Jiyo Natural serves food in a Single Trial Meal, Five Day Starter Pack and Monthly Subscription. Currently Jiyo Natural is operating in Electronics City, Koramangala, Bellandur, Bommanahalli, Dairy Circle, HSR Layout and Jakkasandra. Will be soon expanding to other localities! It was an extraordinary experience with the healthy and delicious food! Previous Post North West Frontier cuisine with a modern rendition – Kopper Kadai, Koramangala, Bangalore. Need to try this out.